Great satisfaction among the organisers of the 29 BIEMH.Strong growth in occupied space and number of visitors. 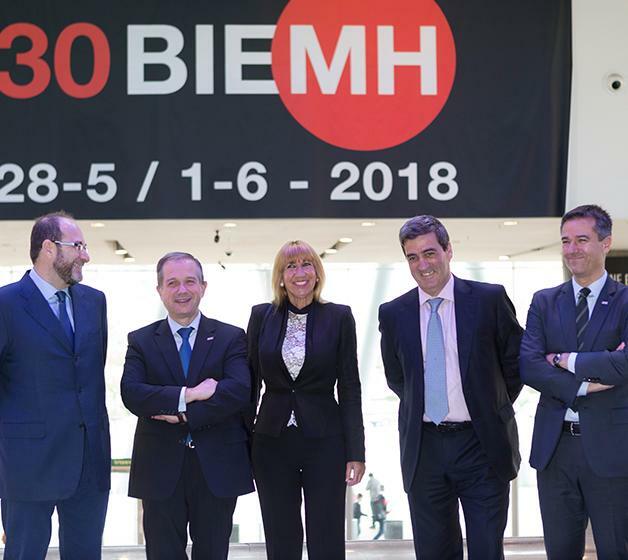 BIEMH2016 began by stating “Make it big” and the show has lived up to its name: business has become “big” over these six days in Bilbao. Participants in the press conference to evaluate this year’s Biennial have been unanimous in their presentation: as the market figures and forecasts had already foreseen, the show has grown in all its aspects, occupying a larger exhibition space and receiving a larger number of visitors. This was asserted by the organisers, Xabier Basañez, Director General of BEC, Mª Carmen Gorostiza, director of BIEMH, Antxon López Usoz, President of AFM and Xabier Ortueta, Director General of AFM. The aisles of the fair have been chocker block since 30th May til 4th June with professionals carrying specific investment projects in their portfolios, who were anxious to discover the latest advances in manufacturing technologies, and curious to find out the latest about additive manufacturing and 3D printing, robotics or industry 4.0. In addition to the spectacular deployment of machine, component and system manufacturers, this year, there has also been a varied offer of conferences and presentations. During the course of the Machine Tool Biennial, the National Awards for Innovation in Advanced Manufacturing, organised by AFM, Advanced Manufacturing Technologies with the support of BEC and Beaz (Innovaton Agency of Vizcaya), were presented to this year’s winners IBARMIA, DANOBATGROUP and MIZAR. The president of AFM, Advanced Manufacturing Technologies, Antxon López Usoz has declared: “For one week, industry has played the leading role in a fantastic fair that shows the commitment of the exhibitors, and that has confirmed the enthusiasm to continue investing in a key activity for our economy”. Following the inauguration on Monday 30th May, presided by the Lehendakari, Íñigo Urkullu, the fair was visited by Arantza Tapia, Regional Minister of Economic Development and Competitiveness, Ángel Toña, Regional Minister of Employment, Markel Olano and Unai Rementería, Regional Members of the Parliaments of Guipuzcoa and the Basque Country, María Luisa Poncela, Secretary General for Science, Technology and Innovation, Idoia Mendía, Secretaria General of PSE, Manuel de la Rocha, responsible for Economy of PSOE, Alex Arriola, Director General of SPRI, and representatives from the Industry Commission of the Basque Parliament, ADEGI, ICEX, CDTI, CONFEBASK, SPRI and from the three Basque Chambers, among others.